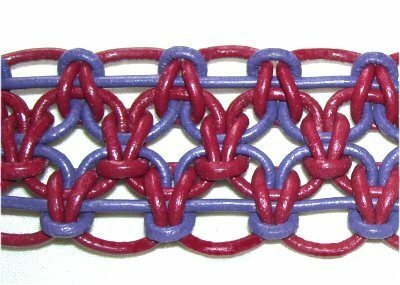 Description: The Leather Star Bracelet is named for the star-like areas in the center between the rows of knots. 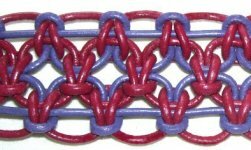 This Macrame bracelet features Alternating Square Knots, and is a good craft project for beginners. 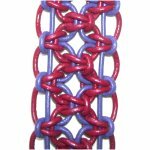 You will be tying Square Knots in both directions, so practice them before creating the bracelet. The band is 1.25 inches wide when using 2mm size cord. To make it more narrow, use 1mm - 1.5mm round leather. 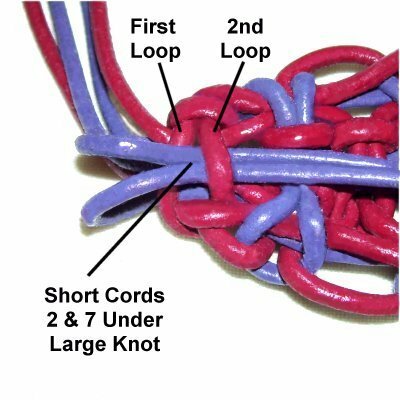 Because leather is stiff, the knots hold their position better than if you were using regular cord. So two cords remain straight, and the loops along the edges are more even. In the images, COLOR A is wine and COLOR B is dark purple. Cut 2 cords of COLOR B, each 16 inches long. Cut 2 cords of COLOR B, each at least 60 inches long. For a Leather Star Bracelet over 8 inches, cut these cords longer. Cut 4 cords of COLOR A, each at least 60 inches long. 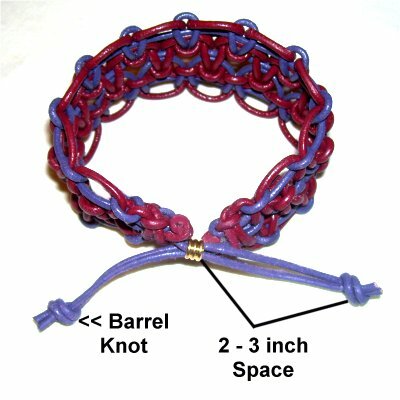 Increase the length for bracelets over 8 inches. Mentally number the cords 1 - 8. Important: You should use a project board to make your Leather Star Bracelet, but do not use pins. That's what the masking tape is for. Pushing pins through leather will damage it. 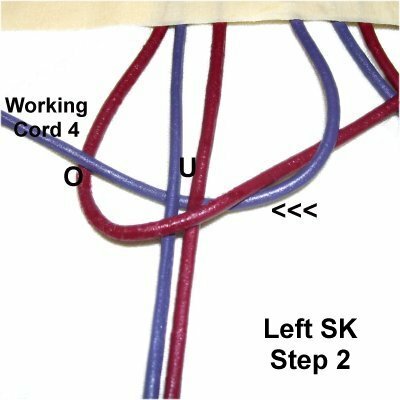 Another option for securing the cords is to use the Cross-Pin Technique or you can LEAN the pins over the cords. Place tape horizontally at the center, across all the cords. Secure each cord above the center with additional tape. The lower portion will be used first. 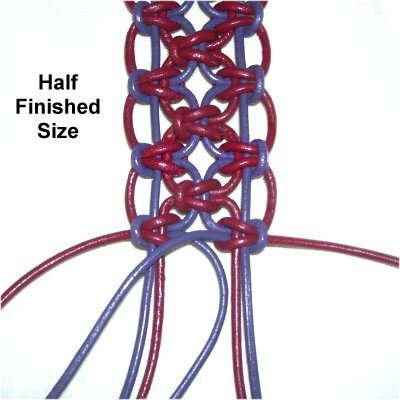 You will be tying both left and right Square Knots, so the heads of the knots face opposite directions at the edges of the Leather Star Bracelet. 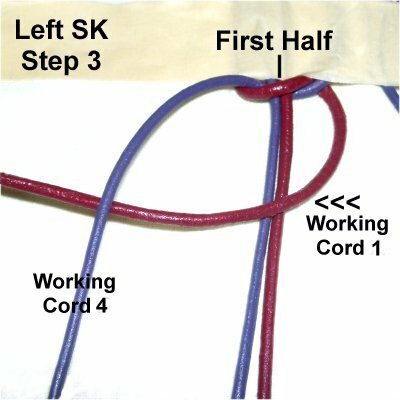 Below are the instructions you follow when tying the SK with the head facing left. Step 2: Cords 1 and 4 are the working cords, tied around cords 2 - 3 (fillers). 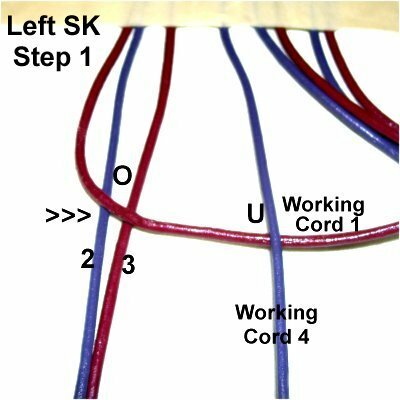 << Move cord 1 to the right, over cords 2 - 3 and under cord 4. Pull both ends and tighten firmly. The working cords have now switched places, so the direction of the movements has changed. cords 2- 3 and under cord 4. Step 3: Working Cords 5 and 8 are used to tie right Square Knots. The fillers are cords 6 and 7. << Move cord 8 to the left, over cords 6 - 7, and under cord 5. The cords have switched places. 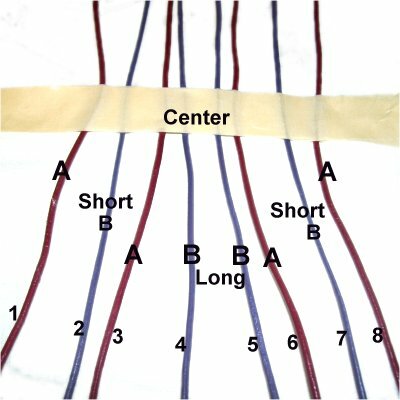 << Move cord 8 to the right, over cords 6 - 7, and under cord 5. Step 4: Here you can see the first two knots, with the heads facing opposite directions. 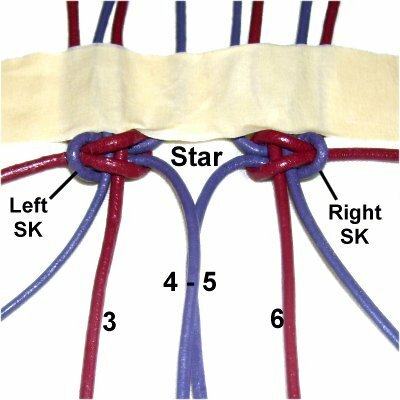 The space between the two knots is considered the "star". 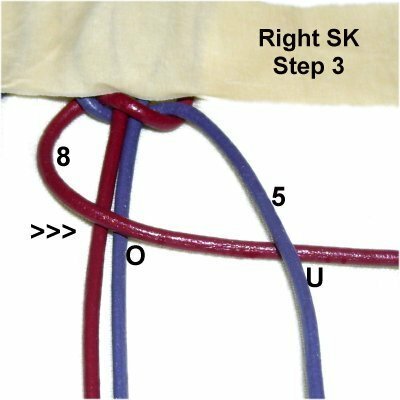 The next LEFT Square knot is tied with cords 3 and 6, around cords 4 - 5. 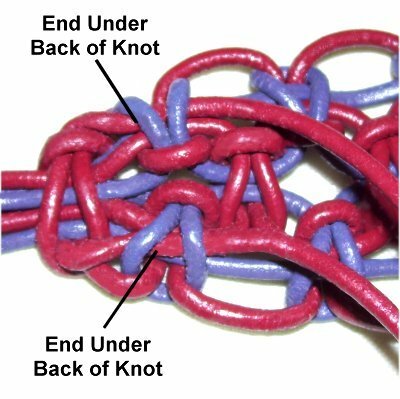 Make sure you tighten the knot so it's balanced and there is a small amount of space between this knot and the two above it. Neatness and symmetry are important aspects of the Leather Star Bracelet design. 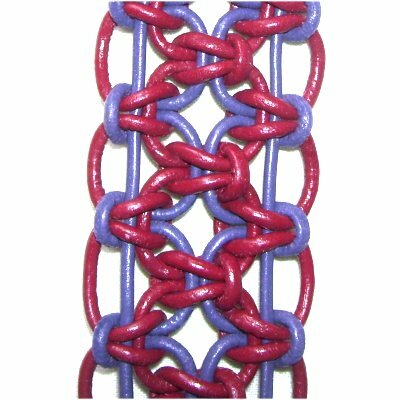 As you progress through the next steps, make sure the knots are horizontal, and tightened so the loops along the edges are the same size. The stars in the center should be the same size, too. Step 5: Repeat steps 2 - 4 several times, to complete the first half of the Leather Star Bracelet. Stop when the bracelet measures 1/2 the size you need. So for an 8-inch bracelet, stop at 4 inches. Make sure you end with two Square Knots (step 3). Step 6: Remove the tape, and turn the entire bracelet around. Start at the center again. 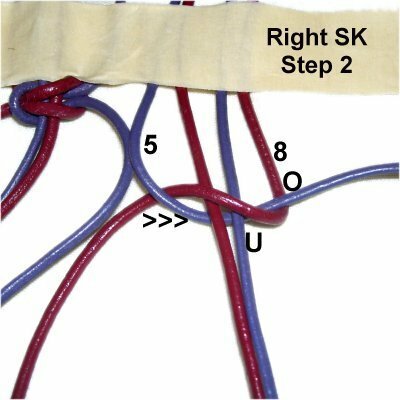 The first knot you tie needs to be a RIGHT SK in order to match those on the first half, which are now turned around. 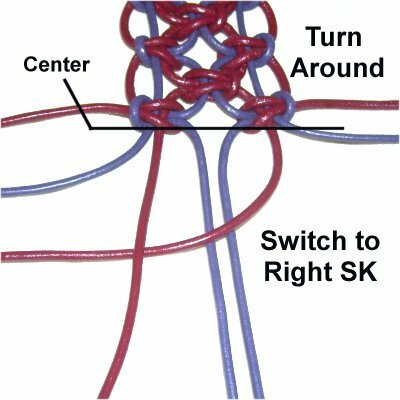 Each time you repeat step 4, the knot will face right. Stop when the Leather Star Bracelet is the size you need. 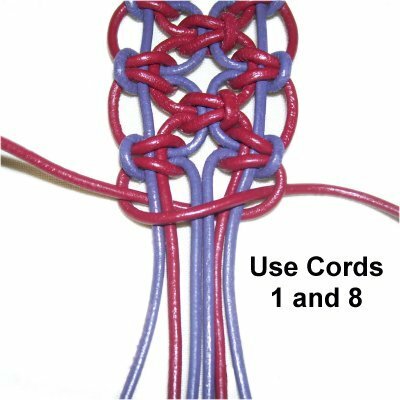 Step 7: At each end, use cords 1 and 8 to tie a Square Knot around all the other cords. Keep the cords flat and straight without overlapping. The knot will be wider than the rest. Step 8: Flip over the Leather Star Bracelet. 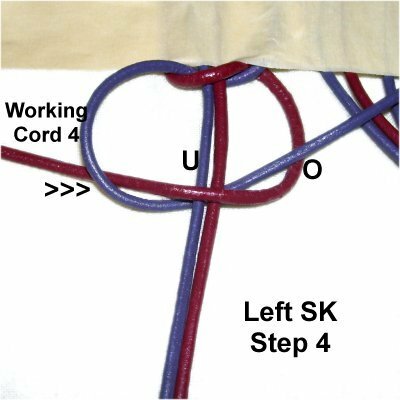 Pass the ends of cords 1 and 8 under the back of the two knots closest to the final one tied in the last step. Apply glue to hold the ends in place. Step 9: Short cords 2 and 7 were not used to tie any knots, so can easily be pulled out. For that reason, they should be finished like the cords in the previous step. Bring them to the back and pass them over the first loop of the large knot (closest to the bottom). Pass them under the second loop. Important: The inside of leather material is usually a lighter color than the outside, and will show when the cords are cut. After cutting, use a marker to change the color of the tips to either black, or the same color of the leather. Select two cords on each end of the bracelet, to be used for the clasp. Cut off the remainder, or finish them off like the others if you wish. Pass the 4 cords you selected through the bead in opposite directions. 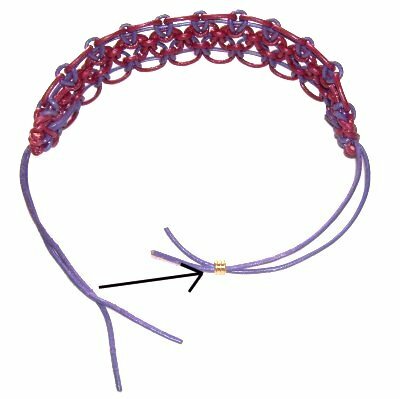 Pull the ends to close the bracelet. 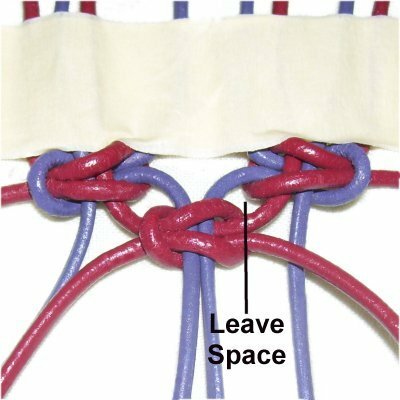 Leave a 2 - 3 inch space, and tie one Barrel knot with each set of two cords. This prevents the ends from sliding through the bead. Have any comments about the Leather Star Bracelet? Contact Me.